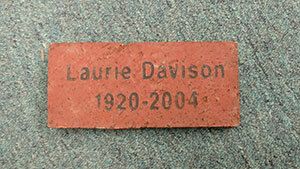 A unique way to celebrate a life or accomplishment, is to purchase an engraved brick. This donation provides an opportunity for people to honor others at a shared ground with the Moss community. 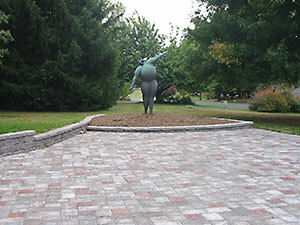 The walkway is located on the patio at the Waynesboro, Virginia home of P. Buckley Moss. The gorgeous view of the Blue Ridge Mountains makes this an ideal location. 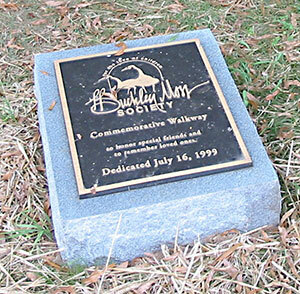 The Commemorative Walkway was dedicated July 16, 1999 on the grounds at the P. Buckley Moss Museum. It provided a peaceful winding path through the property. The museum was donated to Virginia Tech and in 2014 arrangements were made to move the walkway. The original entryway marker has been preserved and lies at the entrance of the patio. You can order a Commemorative Walkway Brick for $40.00. We accept AMEX, Visa, MasterCard and Discover via PayPal. You are also welcome to pay by check. Please make checks payable to the Moss Foundation. All proceeds go to the P. Buckley Moss Foundation to further our mission to reach out and teach children who learn differently. To order a Commemorative Brick please use our ONLINE ORDER FORM or call the Foundation office at (800) 430-1320.